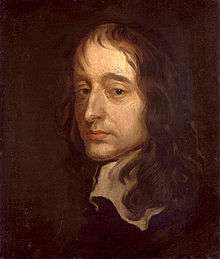 John Selden (16 December 1584 – 30 November 1654) was an English jurist and a scholar of England's ancient laws and constitution and scholar of Jewish law. He was known as a polymath showing true intellectual depth and breadth; John Milton hailed Selden in 1644 as "the chief of learned men reputed in this land." He was born at Salvington, in the parish of West Tarring, West Sussex (now part of the town of Worthing), and was baptised at St Andrew's, the parish church. The cottage in which he was born survived until 1959 when it was destroyed by a fire caused by an electrical fault. His father, another John Selden, had a small farm. It is said that his skill as a violin-player was what attracted his wife, Margaret, who was from a better family, being the only child of Thomas Baker of Rustington and descended from a knightly family of Kent. Selden was educated at the free grammar school at Chichester, The Prebendal School, and in 1600 he went on to Hart Hall, Oxford. In 1603 he was admitted to Clifford's Inn, London; in 1604 he moved to the Inner Temple; and in 1612 he was called to the bar. His earliest patron was Sir Robert Bruce Cotton, the antiquary, who seems to have employed him to copy and summarise some of the parliamentary records then held at the Tower of London. For some reason, Selden very rarely practised in court, but his practice in chambers as a conveyancer and consulting counsel was large and apparently lucrative. In 1618, his History of Tithes appeared. Although it had passed censorship and licensing, this dissertation on the historical basis of the tithe system caused anxiety among the bishops and provoked the intervention of the king. The author was summoned before the Privy Council and was compelled to retract his opinions. Also, his work was suppressed, and he was forbidden to reply to anyone who might come forward to answer it. This all seems to have caused Selden's entry into politics. Although he was not in the Parliament of England, he was the instigator and perhaps the draughtsman of the Protestation of 1621 on the rights and privileges of the House, affirmed by the House of Commons on 18 December 1621. He and several others were imprisoned, at first in the Tower and later under the charge of Sir Robert Ducie, sheriff of London. During his brief detention, he occupied himself in preparing an edition of medieval historian Eadmer's History from a manuscript lent to him by his host or jailor, which he published two years afterwards. In 1623 he was returned to the House of Commons for the borough of Lancaster, and sat with John Coke, William Noy and John Pym on Sergeant Glanville's election committee. He was also nominated reader of Lyon's Inn, an office he declined to undertake. For this the benchers of the Inner Temple fined him £20 and disqualified him from being one of their number. Nevertheless, after a few years, he became a master of the bench. In the first parliament of Charles I (1625), it appears from the "returns of members" printed in 1878 that contrary to the assertion of all his biographers, he had no seat. In Charles's second parliament (1626), he was elected for Great Bedwyn in Wiltshire, and took a prominent part in the impeachment of George Villiers, 1st Duke of Buckingham. In the following year, in Darnell's Case (the Five Knights' Case), he was counsel for Sir Edmund Hampden in the Court of King's Bench. In 1628 he was returned to the third parliament of Charles for Ludgershall, Wiltshire, and was involved in drawing up and carrying the Petition of Right. In the session of 1629 he was one of the members responsible for the tumultuous passage in the House of Commons of the resolution against the illegal levy of tonnage and poundage, and, along with Sir John Eliot, Denzil Holles, Long, Valentine, William Strode, and the rest, he was sent back to the Tower. There he remained for eight months, deprived for a part of the time of the use of books and writing materials. He was then removed, under less rigorous conditions, to the Marshalsea, until Archbishop Laud arranged for him to be freed. Some years before, he had been appointed steward to the Earl of Kent, to whose seat, Wrest in Bedfordshire, he now retired. He was not elected to the Short Parliament of 1640; but to the Long Parliament, summoned in the autumn, he was returned without opposition for Oxford University. He opposed the resolution against episcopacy which led to the exclusion of the bishops from the House of Lords, and printed an answer to the arguments used by Sir Harbottle Grimston on that occasion. He joined in the protestation of the Commons for the maintenance of the Protestant religion according to the doctrines of the Church of England, the authority of the crown, and the liberty of the subject. He was equally opposed to the court on the question of the commissions of lieutenancy of array and to the parliament on the question of the militia ordinance. In the end, he supported Parliament against King Charles, because, according to him, Charles was certainly acting illegally; but Selden was not certain if Parliament was doing the same. In 1643, he participated in the discussions of the Westminster Assembly, where his Erastian views were opposed by George Gillespie. Selden's allies included Thomas Coleman, John Lightfoot, and Bulstrode Whitelocke. He was appointed shortly afterwards keeper of the rolls and records in the Tower. In 1645 he was named one of the parliamentary commissioners of the admiralty and was elected master of Trinity Hall, Cambridge, an office that he declined to accept. In 1646, he subscribed the Solemn League and Covenant and, in 1647, was voted £5000 by the parliament as compensation for his pains under the monarchy. After the death of the Earl of Kent in 1639, Selden lived permanently under the same roof with the earl's widow, the former Elizabeth Talbot. It is believed that he married her, although their marriage does not seem to have ever been publicly acknowledged. He assembled a famous library which eventually became part of the Bodleian Library's collection in 1659. In addition to a wide range of Greek, Arabic, Hebrew and Latin works, it included the Codex Mendoza and the Selden Map of China. He died at Friary House in Whitefriars on 30 November 1654, and was buried in the Temple Church, London. His tomb is today clearly visible through glass plates in the floor of this church. Furthermore, he is commemorated by a monumental inscription on the south side of the Temple Church. More than two centuries after his death, in 1880, a brass tablet was erected to his memory by the benchers of the Inner Temple in the parish church of St. Andrew's, West Tarring. In 1610 three of his works came out: Jani Anglorum Facies Altera (The Back Face [or Two Faces] of the English Janus) and England's Epinomis, which dealt with the progress of English law down to Henry II; and The Duello, or Single Combat, in which he traced the history of trial by battle in England from the Norman Conquest. In 1613 he supplied a series of notes, including quotations and references, to the first eighteen cantos of Michael Drayton's Poly-Olbion. In 1614 he published Titles of Honor [sic], which, in spite of defects and omissions, remained a comprehensive work for centuries. It was republished in a larger and greatly revised edition in 1631 and earned for Selden the praise "monarch of letters" from his friend Ben Jonson. In 1618 his controversial History of Tithes was published. A first sign of the coming storm was the 1619 book controverting Selden, Sacrilege Sacredly Handled in two parts; with an Appendix, answering some objections by James Sempill. Selden hit back, but was soon gagged. The churchmen Richard Tillesley (1582–1621) (Animadversions upon M. Seldens History of Tithes, 1619) and Richard Montagu (Diatribae upon the first part of the late History of Tithes, 1621) attacked the work. There were further replies by William Sclater (The Quaestion of Tythes Revised, 1623), and by Stephen Nettles (Answer to the Jewish Part of Mr. Selden's History of Tithes 1625). In it Selden tried to demonstrate that tithing depended on the civil law, rather than canon law. He also made much of the complexities of the ancient Jewish customs on tithes. The work was also a milestone in the history of English historical writing through its mixture of antiquarian-philological scholarship with historical narrative, two approaches to the study of the past previously seen as distinct. In 1617, his De diis Syriis was issued, and immediately established his fame as an orientalist. It is remarkable for its early use of the comparative method, on Semitic mythology. Also, in 1642, he published a part of the Arabic chronicle of Patriarch Eutychius of Alexandria, under the title Eutychii Aegyptii, Patriarchae Orthodoxorum Alexandrini, ... ecclesiae suae origines. Controversial was the discussion in it of the absence in Alexandria of the distinction between priests and bishops, a burning issue in the debate at the time in the Church of England. In 1644, he published Dissertatio de anno civili et calendario reipublicae Judaicae, in 1646 his treatise on marriage and divorce among the Jews entitled Uxor Ebraica, and in 1647 the earliest printed edition of the old English law-book Fleta. In 1650 Selden began to print the trilogy he planned on the Sanhedrin, as the first part of De synedriis et prefecturis juridicis veterum Ebraeorum through the press, the second and third parts being severally published in 1653 and 1655. The aim of this work was to counter the use by the Presbyterians, in particular, of arguments and precedents drawn from Jewish tradition; it was a very detailed study aimed at refuting such arguments, and pointing out the inherent flexibility of the tradition that was being cited. It had been written sixteen or seventeen years before, but James I had prohibited its publication for political reasons; hence it appeared a quarter of a century after Grotius's The Free Sea (Mare liberum), to which it was intended to be a rejoinder, and the pretensions advanced in which, on behalf of the Dutch fishermen, to poach in the waters off the English coasts it was its purpose to dismantle. The fact that Selden was not retained in the great case of ship money in 1637 by John Hampden, the cousin of his former client, may be accepted as additional evidence that his zeal for the popular cause was neither so warm nor so unsuspected as it had once been. Several of Selden's minor works were printed for the first time after his death, including a tract in defence of the December 25th birth of Christ written during the Puritan Commonwealth (1649–1660) when celebration of Christmas was prohibited. A collective edition of his writings was published by David Wilkins in 3 volumes folio in 1725, and again in 1726. Table Talk, for which he is perhaps best known, did not appear until 1689. It was edited by his amanuensis, Richard Milward, who affirms that "the sense and notion is wholly Selden's" and that "most of the words" are his also. Its genuineness has sometimes been questioned. He was sceptical of the legend of King Arthur as it had grown up, but believed Arthur had existed. The Druids, he suggested in comments on Poly-Olbion, were ancient and presumed esoteric thinkers. The popular image of a Druid descends via a masque of Inigo Jones from a reconstruction by Selden, based (without good foundations) on ancient German statuary. Richard Cumberland followed Selden over both Grotius and Hobbes on natural law. Selden contested the scholastic position, after Cicero, that "right reason" could by its dictates alone generate obligation, by claiming that a formal obligation required a superior in authority. In his De legibus Cumberland rejects Selden's solution by means of the Noahide laws, in De jure naturali, in favour of Selden's less developed alternate solution. The latter is more orthodox for a Thomist, an intellectus agens as a natural faculty in the rational soul, by the mediation of which divine intellect can intervene directly with individuals. Matthew Hale tried to merge the theory of Grotius on property with Selden's view on obligation. Cumberland and Hale both belonged to a larger group, followers in a broad sense of Selden, with backgrounds mostly of Cambridge and the law, comprising also Orlando Bridgeman, Hezekiah Burton, John Hollings, Richard Kidder, Edward Stillingfleet, John Tillotson, and John Wilkins. Giambattista Vico called Grotius, Selden and Samuel Pufendorf the "three princes" of the "natural right of the gentes". He went on to criticise their approach foundationally. In his Autobiography he specifies that they had conflated the natural law of the "nations", based on custom, with that of the philosophers, based on human abstractions. Isaiah Berlin comments on Vico's admiration for Grotius and Selden. ↑ Glen Burgess, The Politics of the Ancient Constitution (1992), p. 95. ↑ Francis J. Bremer, Tom Webster. Puritans and Puritanism in Europe and America: A Comprehensive Encyclopedia (2006), p. 105. ↑ Sommerville, Johann. "The English Revolution, 1647–1649". University of Wisconsin. Retrieved 8 June 2016. ↑ The Epinomis (Greek Ἐπινομίς) is the name of one of Plato's dialogues, which was an appendix to his Laws (Greek Νόμοι, Nomoi). 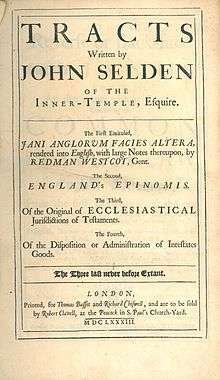 Thus, the title England's Epinomis indicates that the work is an appendix to Selden's Jani Anglorum Facies Altera. ↑ James Loxley, The Complete Critical Guide to Ben Jonson (2002), p. 100. ↑ Colin Kidd, British Identities Before Nationalism: Ethnicity and Nationhood in the Atlantic World, 1600–1800 (1999), p. 85. ↑ Michael Lapidge, Malcolm R. Godden, Simon Keynes, Anglo-Saxon England (2000), p. 250. ↑ "The Scottish Nation, Semple". electricscotland.com. Retrieved 8 June 2016. ↑ Charles John Sommerville, The Secularization of Early Modern England: From Religious Culture to Religious Faith (1992), p. 100. ↑ Adam Sutcliffe, Judaism and Enlightenment (2005), p. 47. ↑ David C. Douglas, English Scholars (1939), p. 171. ↑ David Armitage, British Political Thought in History, Literature and Theory, 1500–1800 (2006), p. 57. ↑ Mark W. Janis, Religion and International Law (1999), pp. 68–9. ↑ Johann Somerville, Hobbes, Selden, Erastianism and the history of the Jews, pp. 168–9, in Graham Alan John Rogers, Tom Sorell, Hobbes and History (2000). ↑ Steven Matthews, Theology and Science in the Thought of Francis Bacon, pp. 125–8. ↑ Rodney Castleden, King Arthur: The Truth Behind the Legend (2003), p. 49. ↑ Haycock, David Boyd (2013). "Chapter 7: 'Much Greater, Than Commonly Imagined.'". The Newton Project, University of Sussex. Retrieved 8 June 2016. ↑ Kelly Boyd, Encyclopedia of Historians and Historical Writing (1999), p. 1082. ↑ Pattison, Mark (1879). English Men of Letters, Ch. 8. ↑ Richard Tuck, Philosophy and Government 1572–1651 (1993), pp. 272–4. ↑ A. P. Martinich, The Two Gods of Leviathan: Thomas Hobbes on Religion and Politics (2003), p. 381. ↑ Jon Parkin, Science, Religion and Politics in Restoration England: Richard Cumberland's De Legibus Naturae (1999), pp. 61–4. ↑ Richard Tuck, Natural Rights Theories: Their Origin and Development (1981), p. 162. ↑ Jon Parkin, Science, Religion and Politics in Restoration England: Richard Cumberland's De Legibus Naturae (1999), pp. 26–8. ↑ Thomas Goddard Bergin and Max Harold Fisch (translators), The New Science of Giambattista Vico (1970 edition), section 493 at p. 123; translation revised by replacing "law" with a faithful rendering of "diritto" as "right". ↑ Thomas Goddard Bergin and Max Harold Fisch (translators), The Autobiography of Giambattista Vico (1975 edition), p. 172. ↑ Isaiah Berlin, Against the Current (1997 edition), p. 118. Sergio Caruso, La miglior legge del regno. Consuetudine, diritto naturale e contratto nel pensiero e nell’epoca di John Selden (1584–1654), Giuffrè: Milano 2001, two vols. G. J. Toomer, John Selden: A Life in Scholarship (Oxford, OUP, 2009) (Oxford-Warburg Studies). Wikimedia Commons has media related to John Selden.